Wounded Times: Marine Vietnam Veteran Wonders Who Is In His Grave? Marine Vietnam Veteran Wonders Who Is In His Grave? 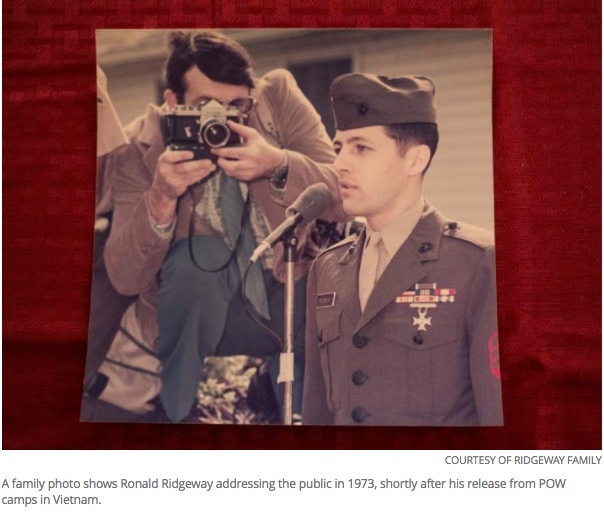 HALLETTSVILLE, Texas — Ronald Ridgeway was “killed” in Vietnam on Feb. 25, 1968. The 18-year-old Marine Corps private first class fell with a bullet to the shoulder during a savage firefight with the enemy outside Khe Sanh. Dozens of Marines, from what came to be called “the ghost patrol,” perished there. At first, Ridgeway was listed as missing in action. Back home in Texas, his old school, Sam Houston High, made an announcement over the intercom. But his mother, Mildred, had a letter from his commanding officer saying there was little hope. And that August, she received a “deeply regret” telegram from the Marines saying he was dead. On Sept. 10, he was buried in a national cemetery in St. Louis. A tombstone bearing his name and the names of eight others missing from the battle was erected over the grave. His mother went home with a folded American flag. But as his comrades and family mourned, Ridgeway sat in harsh North Vietnamese prisons for five years, often in solitary confinement, mentally at war with his captors and fighting for a life that was technically over. Last month, almost 50 years after his supposed demise, Ridgeway, 68, a retired supervisor with Veterans Affairs, sat in his home here and recounted for the first time in detail one of the most remarkable stories of the Vietnam War. In the end, of the 26 missing and presumed killed in action on Feb. 25, remains of all but nine were positively identified, according to Pipes and Stubbe.